Joel Embiid collected 37 points and a career-high 22 rebounds to go along with a late key block on Kyrie Irving as the host Philadelphia 76ers rallied late to defeat the Boston Celtics 118-115 on Wednesday night. Who's leading the East? Who's leading the West? Joel Embiid collected 37 points and a career-high 22 rebounds to go along with a late key block on Kyrie Irving as the host Philadelphia 76ers averted a season sweep by the Boston Celtics with a 118-115 victory on Wednesday night. Embiid also made a personal-best 20 free throws (on 21 attempts). Jimmy Butler scored 15 of his 22 points in the fourth quarter for the 76ers, who have won six in a row overall. Irving scored 16 of his 36 points in the first quarter for the Celtics, who fell short against Philadelphia for just the third time in the teams’ past 20 regular-season meetings. Al Horford scored 22 points and Terry Rozier added 20 points off the bench for Boston, who saw guard Marcus Smart receive a flagrant-2 foul and an immediate ejection less than a minute into the third quarter following a two-handed shove into the back of Embiid. 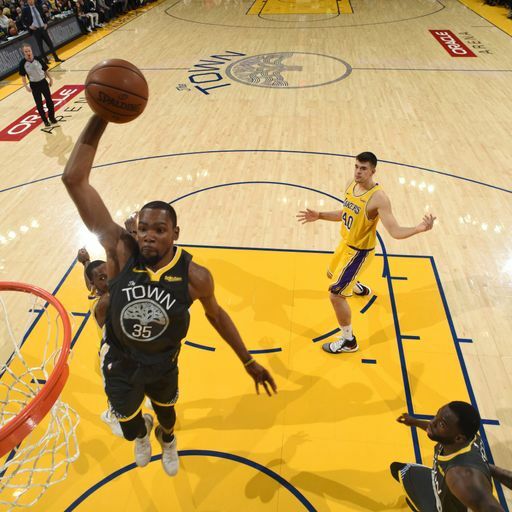 The Celtics also saw a nine-point lead evaporate in the fourth quarter with Butler draining a trio of three-pointers in a three-and-a-half -minute stretch to forge a tie at 105. The teams were deadlocked at 113 with 1:17 left before Ben Simmons’ driving lay-up and subsequent foul shot regained the lead for the 76ers with 40.8 seconds remaining. Irving’s floating jumper was blocked by Embiid with 30 seconds remaining, and Butler drilled a jumper at the other end to push the advantage to 118-113 and ice the game with 5.5 seconds left. Jonas Valanciunas’ offensive rebound and free throw with 0.1 seconds left in overtime helped the host Memphis Grizzlies topple the Houston Rockets 126-125 at FedExForum. Valanciunas paired a career-high 33 points with 15 rebounds and teamed with Mike Conley (35 points, eight assists) to help Memphis fend off James Harden and the rallying Rockets. Valanciunas corralled a miss by Conley before absorbing a foul from Houston center Clint Capela on the game’s deciding play. That followed an MVP-caliber stretch from Harden, who scored 18 of his game-high 57 points in the fourth quarter before adding eight points during a 28-second stretch in overtime. Harden shot 9-of-17 on three-point range. Former Rockets forward Chandler Parsons drilled a pair of threes in overtime to keep the Grizzlies in control as Harden nearly resurrected Houston again. Harden gave the Rockets their first lead with a block and transition lay-up at the 3:24 mark of overtime. Chris Paul added 18 points and seven assists but shot 6-of-17 while Capela posted 14 points and 10 rebounds for the Rockets, who were without guard Eric Gordon (rest) and forward Kenneth Faried (sore knee). Pascal Siakam scored 33 points and grabbed 13 rebounds to lead the Toronto Raptors to a 123-114 overtime win against the host Oklahoma City Thunder. The Raptors dominated overtime, outscoring the Thunder 13-4 after letting a 19-point second-half lead slip away. Oklahoma City didn’t score in the extra period until 31.5 seconds remained. Kawhi Leonard scored five of his 22 points in overtime and Fred VanVleet finished with 23 points for the Raptors. Toronto were firmly in control for much of the game until a late push by the Thunder cut the lead to two on Paul George’s three-pointer with 40.9 seconds left. George scored nine consecutive Oklahoma City points to put the Thunder back in the game, but he wasn’t around for the end after picking up his sixth foul on the ensuing possession. However, Oklahoma City forced a stop, and then Russell Westbrook gathered a head of steam and finished with a lay-up to tie the game with less than five seconds remaining. The Thunder had the chance to win in regulation after Dennis Schroder drew a charge as Siakam attempted what would have been the game-winner. Westbrook’s three-point attempt at the buzzer fell short to send the game to overtime where the Raptors assumed control. Westbrook finished with 42 points and 16-of-29 shooting, including 5-of-10 from behind the three-point arc. Victory moves the Raptors are just two games behind the Bucks for the top spot in the Eastern Conference. While the Raptors are surging, the Thunder’s fade continued. Since the All-Star break, Oklahoma City is only 5-10, including defeats in each of their past four games. 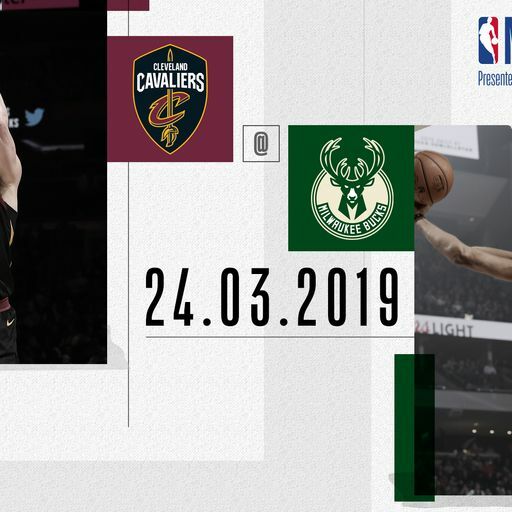 Collin Sexton scored 25 points and Jordan Clarkson added 23 off the bench to lead the Cavaliers to a 107-102 win over the short-handed Milwaukee Bucks. With Cleveland nursing a 103-100 lead, Sexton’s driving lay-up put the Cavaliers up by five. Eric Bledsoe followed with a pair of free throws. Cedi Osman’s corner jumper was off the mark, giving the Bucks one last chance with 11.5 seconds remaining. Milwaukee called time out and the inbounds pass went through Pat Connaughton’s hands with Clarkson recovering for Cleveland. Cleveland center Ante Zizic added eight points and 10 rebounds, including five on the offensive end in the fourth quarter to help the Cavaliers improve their home record to 6-2 since the All-Star break. Milwaukee dressed only nine players and were without Giannis Antetokounmpo and Nikola Mirotic. Antetokounmpo missed his second straight game with an ankle injury while the Bucks on Wednesday said Mirotic will be out two to four weeks with a sprained thumb. Khris Middleton led Milwaukee with 26 points and 12 rebounds. Bledsoe added 24 points, eight rebounds and eight assists. The Cavaliers lost Kevin Love after he and Bledsoe banged heads late in the first half. He stayed in the game for a few possessions but then left the court and was being evaluated for a possible concussion. Damian Lillard scored 33 points and handed out 12 assists as the Portland Trail Blazers knocked off the visiting Dallas Mavericks 126-118. 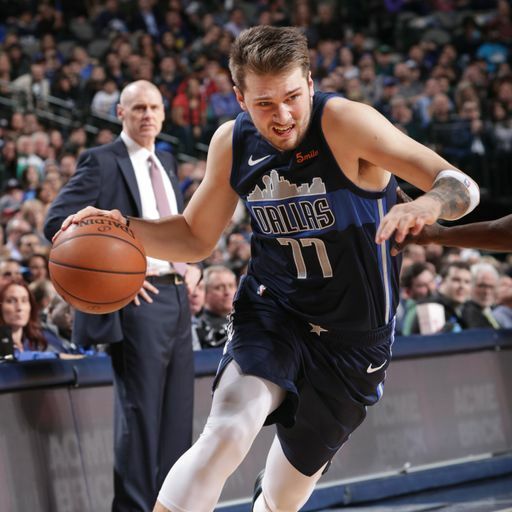 Luka Doncic scored 24 points and Justin Jackson contributed 21 for the Mavericks, who have lost 14 of their last 16 outings. Lillard had 16 points and nine assists as Portland seized a 65-52 lead at intermission. The Mavericks trimmed it to 67-59 early in the third quarter. Portland carried a 101-83 lead into the final period. The difference was 115-90 with nine minutes to go. Dallas closed the gap to 124-115 on a Jackson layup with 1:21 to play. Jackson’s put-back then brought the Mavericks to within 124-117 with 47 seconds remaining. But Anfernee Simons hit a pair of free throws to give Portland a 126-117 lead with 40.5 ticks left and ensure the win. Donovan Mitchell scored 30 points in three quarters as the Utah Jazz easily ran their winning streak to five games by rolling to a 137-116 rout of the host New York Knicks. The Jazz scored 11 of the game’s first 14 points, led for the final 46:04, held a double-digit lead for the final 37:40 and led by as many as 37 as no starter played more than 29 minutes. Mitchell helped the Jazz get their latest win by shooting 12-of-20 and hitting five three-pointers. He recorded his 14th 30-point game of the season and 10th since January 1 as the Jazz shot 56.5 per cent. Center Rudy Gobert narrowly missed his 57th double-double, finishing with 18 points and nine rebounds. 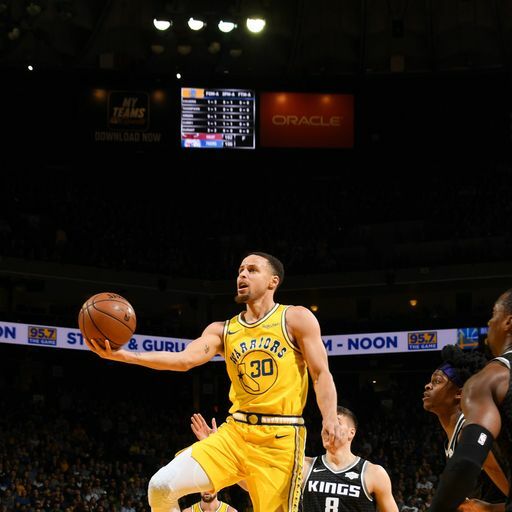 He was 7-of-7 from the floor – all on dunks – and upped his league-leading total to 260. Joe Ingles added 18 points by hitting six three-pointers as Utah shot 47.6 per cent from behind the arc and matched a team record by hitting 20 triples. Ricky Rubio contributed 12 points and nine of Utah’s season-high tying 38 assists. Rookie Kevin Knox scored 27 points for the Knicks, who lost for the 10th time in 11 games. Mario Hezonja added 23 points for New York. Goran Dragic scored 22 points and Dwyane Wade had a big basket and a steal in the final minutes as the visiting Miami Heat outlasted San Antonio 110-105 to snap Spurs’ nine-game winning streak. After trailing by as many as 18 points in the third quarter and by 13 with 9:50 to play, San Antonio charged back, pulling within 106-103 on a technical-foul free throw by LaMarcus Aldridge with 2:05 remaining. However, the Spurs came up empty on the ensuing possession, and Wade hit a bank shot to build the Heat’s lead back to five points. With Miami on top 108-105, Wade stole the ball from DeMar DeRozan with 9.1 seconds left. Kelly Olynyk then converted a pair of free throws to cement the win for the Heat. Dion Waiters scored 18 points for the Heat. Josh Richardson had 15, James Johnson added 13, Hassan Whiteside tallied 12 and Wade had 11 for Miami, who have won eight of their past 10 games. Bam Adebayo took 15 rebounds in the victory for the Heat. Miami (35-36) hold a one-and-a-half game lead on the Orlando Magic for the Eastern Conference’s final playoff spot. Patty Mills, Marco Belinelli, and Aldridge scored 17 points each for the Spurs. DeRozan added 16 points and grabbed a season-high 15 rebounds, Gay scored 15 points, and Davis Bertans contributed 10 for San Antonio. Wade was playing his final regular-season game in San Antonio. He was given signed Tim Duncan, Tony Parker, and Manu Ginobili jerseys by Spurs coach Gregg Popovich before the game as a retirement present. The Orlando Magic led from start to finish, pounding the New Orleans Pelicans 119-96 at home as Evan Fournier led all scorers with 22 points. Aaron Gordon added 20 points plus seven rebounds and Nikola Vucevic chipped in 15 points and 17 rebounds. The Magic improved to 34-38, maintaining pressure on the Miami Heat for the eighth and final playoff spot in the Eastern Conference. Frank Jackson was the only Pelican starter to score in double figures, netting 14 points. Reserve Stanley Johnson scored a team-high 18, Ian Clark had 17 points off the bench, and reserve Cheick Diallo had seven points and 11 rebounds. Pelicans star forward, Anthony Davis, did not play due to a family matter. The Magic took a double-digit lead less than four minutes into the game and never let the Pelicans back into it. Orlando led by 14 after one quarter one, 22 by half-time, 31 after the third quarter and by as much as 35 in the fourth. Kris Dunn atoned for a late miss in regulation with a pair of three-pointers in overtime and Lauri Markkanen added a back-breaking trey with 32.3 seconds remaining, sending the Chicago Bulls to a 126-120 victory over the visiting Washington Wizards. After Robin Lopez’s two free throws opened the scoring for the Bulls in the five-minute extra session, Dunn increased Chicago’s lead to five with his first three-pointer of the overtime. Bradley Beal countered with a pair of free throws for Washington, but Dunn then struck again, bombing in another three-pointer to push the Bulls six points in front. Dunn missed two free throws with a 121-117 lead and one minute remaining, and Beal dropped in two more foul shots to make it a two-point game. Markkanen, the game’s leading scorer with 32 points, then connected from 26 feet, giving the Bulls a cushion they were able to retain the rest of the way. Markkanen, who also collected a game-high 13 rebounds, and Dunn (26 points, 13 assists) recorded double-doubles for the Bulls, who won their second straight after a five-game losing streak. Jabari Parker, traded from Chicago to Washington at the deadline, led the Wizards with 28 points. Beal compiled 27 points, seven rebounds and seven assists.